With mortgage volume down sharply since mortgage rates creeped higher last year, lenders are focusing on jumbo mortgages, especially ARMs that can expand affordability. There’s also a good audio clip embedded in the piece. 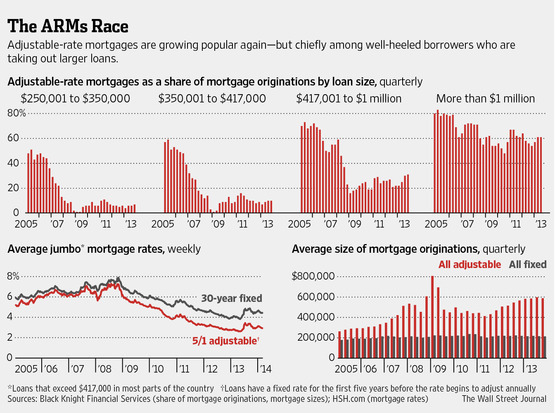 Lenders are pricing ARMs roughly 1.5% below a fixed rate, the largest spread in a decade. ARMs comprised 31% of mortgages in the $417,001-to-$1 million range that were originated during the fourth quarter of 2013, according to data prepared for The Wall Street Journal by Black Knight Financial Services, formerly Lender Processing Services, a mortgage-data and services company. That is up from 22% a year earlier and the largest proportion since the third quarter of 2008. I find it interesting that many suggest that ARM products – including within this article – were one of the causes of the housing bubble. I disagree. I saw them merely as a tool to be misused, just like a hammer or a chainsaw. At least for now, with credit remaining very tight, it is unlikely that they would be abused in the same way they were during the prior housing boom. However with the 70% plunge in lucrative refi volume, one has to wonder when business decisions will start to overwhelm risk paranoia.